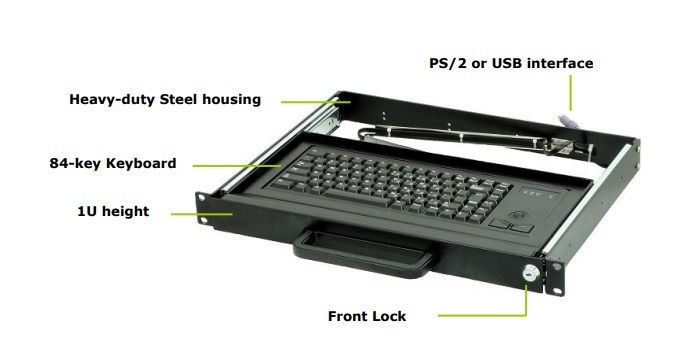 The KEY-G84B-BLK is 1U ruggedized Keyboard drawer with Cherry keyboard module and built-in Trackball. It provides a cost effective solution for your system with a very reliable and durable keyboard and trackball input devices in 1U height rack unit, and can slide neatly into your cabinet when not in use – to save your limited space. The KEY-G84B-BLK is 1U ruggedized Keyboard drawer with Cherry keyboard module and built-in Trackball. It provides a cost effective solution for your system with a very reliable and durable keyboard and trackball input devices in 1U height rack unit, and can slide neatly into your cabinet when not in use – to save your limited space. Available in PS/2 interface for backward compatibility with existing system, and with optional USB interface for current advanced host system. The KEY-G84B-BLK is designed to be easily and quickly assembled into your rack cabinet.